As mentioned in folklore, the mountain was named after Denh, often mistaken as Den (meaning ‘black’), the daughter of a local official. About ten kilometers away from Tay Ninh town, about over twenty kilometers away from Hanoi Vietnam, in the middle of Mekong Delta is Ba Mountain (Nui Ba)-also known as Ms. Den Mountain (Nui Ba Den). As mentioned in folklore, the mountain was named after Denh, often mistaken as Den (meaning ‘black’), the daughter of a local official. Running away from an arranged marriage, Den decided to lead a religious life in a Buddhist monastery on the mountain for the rest of her life. After Den’s death, Nguyen Dynasty entitled her as Saint Linh Son (Linh Son Thanh Mau), built a temple to commemorate the figure, and casted a statue in black bronze for her. Later on, this mountain has been called Nui Ba as we know today. Also, local people establish the custom of holding Nui Ba Festival during the first lunar month in order to commemorate the Saint. Pilgrimages from all parts of the country especially Ho Chi Minh City and Vietnam’s southern cities—join together to pay Nui Ba a visit and enjoy the amazing view as well as religious atmosphere there. Highlight of the festival is on the 18th and 19th day of the first lunar month when Via Ba ceremony is conducted. Before that, at midnight, ceremony of washing the Saint’s statue—Moc Duc—is carried out by the head of Dien Ba. 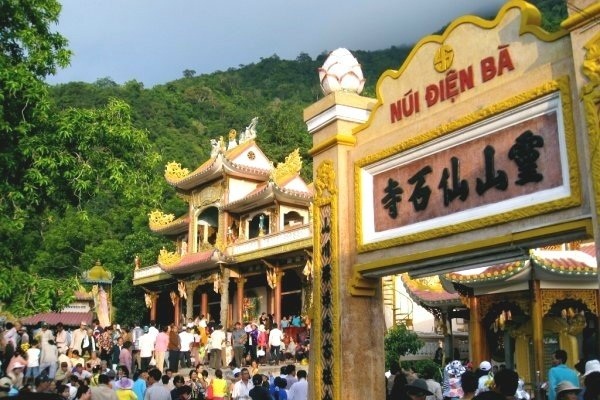 Apart from being a religious event, Nui Ba Festival is a remarkable activity representing South Vietnam travel folklore culture as well as a special occasion for people to spend valuable time having fun together.